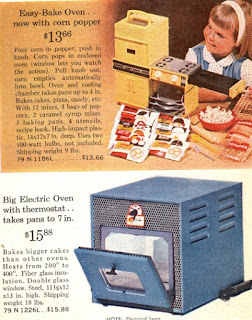 Did you have an Easy Bake Oven as a child? I had one as a little girl. I remember adding water to the little baking mixes and sliding them on a tray inside the oven, where they baked with an incandescent bulb. It was great fun, although I will admit the baked goods were never as delicious as the ones my Mom and I baked in the kitchen. As a little girl, I loved anything related to cooking, whether playing with cooking toys, reading cookbooks for children, or cutting out colorful recipes from my Mom's magazines. The Easy Bake Oven was invented by James O. "Jeep" Kuhn, and first introduced in 1963 by Kenner toys. It was originally heated by two 100-watt incandescent bulbs, and was available in pale blue or butter yellow color. The oven heated up to 350 degrees. This 1965 Sears catalog page features an Easy Bake Oven with a corn popper! Other 1960's Easy Bake Ovens included a Bubble Gum Recipe and a Potato Chip Maker. I do not recall any of these variations ... my Easy Bake made little cakes and brownies. The colors were updated in 1969 to avocado green and red, and later, in 1971, to yellow or mint green. In 1973 the ovens were once again red, and featured Betty Crocker branding. In 1981, the oven was bright yellow and resembled a little microwave. Kenner merged with Hasbro, and the Easy Bake Oven was marketed by Hasbro beginning in 1993. 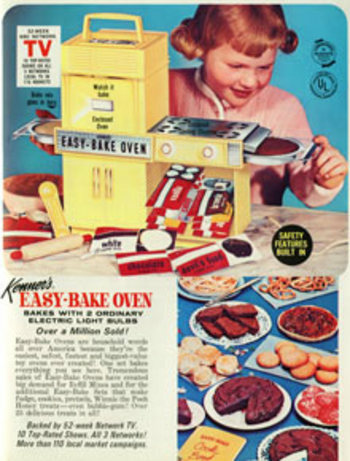 Over the years, 23 million Easy Bake Ovens have been sold. This toy entered the National Toy Hall of Fame in 2006. Do you remember the Easy Bake Oven? I'd love to hear your memories in the comments, below. I didn't have it, but it looks so cool! Thanks for stopping by! I enjoyed reading your comments. I had fun learning more about Easy Bake history for this blog post. I always wanted an Easy Bake Oven as a girl. Now I have two girls of my own and an Easy Bake Oven is on my list! ;) Thanks for these fun facts! Katie, that sounds fun for your girls!